Anna Nicholas was born in Kent and largely brought up in London. She lives in Mallorca with her husband and writes about her life commuting between London and the Spanish island of Mallorca. 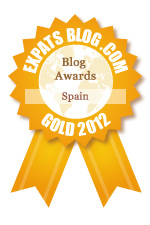 ExpatsBlog.com Expat Blog Awards 2012: Spain Gold Award! This blog won the Gold Award for best expat blog in Spain! I always read Anna Nicholas' blogs. Insightful, newsy sometimes very funny indeed and at other times poignant. They give me the sort of information about Spain and Mallorca that brings the country to life. Her observations about life as a Brit living in a rural mountain town in Mallorca are very witty and pertinent. Anna's blog makes me smile in wonder - I realise that Spain really is "another country", especially Mallorca, and that, they really "do things differently there". In particular I get the impression that the Spanish are far better at leaving life's troubles behind for as long as it takes, and simply enjoying themselves. It's something the majority of Brits only know how to do by "going down the pub" and getting "well and truly rat-arsed". Whilst Anna never views Spain through rose-tinted spectacles (as in her campaigning for the preservation of coastal properties in danger of demolition), she does capture, with tireless invention, the ways in which the Spanish persist obstinately in taking spontaneous pleasure in life. Of-course there's always a darker side, and Anna can capture this too, with her deliciously warped humour. But on the whole, her blogs cheer me up big time, reminding me that there are other ways to live, if only us lot over 'ere, with our cockles and our godforsaken football and our interminable winter afternoons, had been born with the Mediterranean talent for taking pleasure in the sun-kissed moment. The only blog I consider it worth reading! We follow Anna's blogs always! We are huge fans of Mallorca, and Soller in particular, so it is a fabulous way of finding out the latest goings-on of this quirky little island! Anna brings it all to life, and when she talks about people and places, you are right there with her and the extended family of people and animals, living the dream. We are lucky enough to live that dream for a total of about 6 weeks every year so for us it is especially poignant. Being such a fan of Anna's work I have been encouraged to read other similar articles and books, but they somehow never live up to Anna's high standards of writing. Keep at it Anna - we would miss it if you stopped these wonderful scribblings! When I first came across Annaâ€™s writings I was already a committed Mallorca visitor and more particularly an ardent Sollerite! Sadly, our visits are few and far between so Annaâ€™s blogs help to fill the gaps. Her writing cleverly pitches the hot topics and in her own special way she brings out the salient points, injecting her own distinct brand of humour when and where appropriate. Her descriptions bring the characters and places to life making it all too easy to immerse myself in my â€œother worldâ€� and bringing a brief moment of reflected pleasure in a busy working day. I thoroughly recommend Annaâ€™s blogs to those of you who, like me, are already fans of the Spanish and Mallorcan way of life. And to those of you who have not yet discovered the delights of Island life, this is a highly recommended way to start. Her books quite literally changed my life!! I read them back in the UK and at the time we were discussing moving out to live on the Island.Her insight,love and honesty made our minds up..and here I am.Her humour makes her life,the Island and her family seem like a part of our own world no matter where we may be! Whether describing the endearing idiosyncrasies of her adopted homeland and its inhabitants, providing anthropological insights on mouse goats and midwife toads, or simply sharing her delight at having found her 'Paradise Island' Anna's blogs are always eminently readable. Anna makes the 'Other Mallorca', alien to the Magalufian, come to life. Her blog is alternately amusing, witty, informative and compelling. Certainly the best of the bunch. I live in a village called Mielan in the Gers which is in SW France and can readilly identify a lot of similarities with Anna and where she lives. AnnaÂ´s blogs are always most readable and tells how it actually really is and not maybe how some editors might like to hear it!? Anna is an enthusiastic Brit. Whether she realises it or not, her sense of being a British person in Mallorca comes through. So she like so many other British ex-pats in Europe are enhancing the culture of Europe and binding us together as Europeans. Wonderful blog , we can rediscover the island and find new ways of living Mallorca!! An excellent example of how a good blog can help entertain and strengthen the links between expats. I love the content, keep it up. Any successful blog writer needs to capture the readerâ€™s attention immediately, be able to instinctively recognise interesting subject matters â€˜of the momentâ€™, express an honest opinion, be ready to be challenged by their audience and respond and discuss the issues openly. In her Expat blog, Anna Nicholas shows all of these qualities in abundance, always writing intelligently, and frequently with wit and bucket loads of infectious dry humour. Annaâ€™s blog posts about her life in Majorca and further afield in Spain are instantly enjoyable and have provided me with a unique and characterful insight into the joys, trials and tribulations of village life as an expat abroad, and above all the tremendous welcome and affection Anna and her family have received from the local community of Soller. Really great blog, gives a fantastic insight into being an expat in Mallorca. Her writing is funny, clever and always interesting! At 83 years of age,ex RAF conscript, retired near Perpignan 20+ years with my wife. One of the 10,000 Equitable Life WPA's barred from even belated compensation, still fighting for this and Winter Fuel allowance, dis-enfranchised by the 15 year rule a follower of your excellent Blog which gives a valued voice to the elderly expats detested by the British Government, even though our being here saves them more than Â£7,000 a year each supporting us. A duty taken over for us by France in the most efficient manner using their best health service in the western world. Anna has boundless energy and enthusiasm for life in general and for life in Mallorca. This is more than apparent in her own blog and other articles she writes for leading publications. Her articles are informative, funny and highly relevant to her audience. I am an anglo-spaniard and Anna is one of the few expats I know who truly captures the essence of Spain and Mallorca - the good, the bad and the ugly, but in an entertaining and non judgemental way. A true gem! A fantastically witty and well-written blog - a sheer joy to read! Fabulous blog. Reminds me of happy, sunny fun days in Mallorca. Insightful, vivid, captivating, eloquent and above all hilarious. The kind of dry wit that forbids reading in public for fear of unrefined snorts of amusement. Excellent. I always love reading Anna's posts. For me they're a window into a different world - and one which she knows so well. Hugely informative - but insightful, amusing and moving, too. Anna's blogs are brilliantly witty, funny and she writes like a dream. She brings Majorca gloriously to life! But she is so well-informed and perceptive in her comments, that for Spanish politicians - and British - she should be required reading. Great stuff! Always entertaining, always factual and up to the minute. Keep on writing and bring your view on Mallorca and Soller out for us to discover and enjoy. Living in a neighbouring village to Anna's in Mallorca as I do, and also knowing only too well what it's like going backwards and forwards to London, I find her blogs keep me in touch with the key aspects of life for a Brit based in Spain. Her writing is witty, informative and interesting and covers a wide range of fascinating subjects. She certainly knows her 'stuff' and is full of the most interested facts and stories that bring our mutually beloved region of Spain to life. Love reading Anna's posts. She shows a real picture of Mallorca and their people. Full of respect, Anna invites anyone becoming a Mallorcan to learn their language and understand their culture as a way to be happier. Living in Mallorca, I've come to love Anna's take on our Isla de la - sometimes not so - Calma. She gets the people and the place right and is always great fun to read. Always interesting, always enjoyable, forever insightful, vivid, captivating, eloquent and above all hilarious. The best of the best. Anna's blog is a great way of keeping in touch with Spain, Mallorca and the issues. She is quick to pick up current issues and I love the slant on what it is doing in Mallorca, can be a bit of an addition to her books to keep me going between them. I loved the one about the locals putting super glue in the new parking meters and I was not at all aware of the charging for school lunches even if the children bring their own. Keep up the good work. Always love reading Anna's blogs,it is a fabulous way of finding out the latest goings-on of this lovely island! I fell in love with Mallorca on annual holidays when I was in my 20's and 30's. I got to know the island and the Islanders extremely well. Those memory's have been kept alive and up to date by Anna's blog. Her observations, both good and bad, keep my knowledge fresh and up to date, she is highly amusing and her ability to describe a place, person or event is first class allowing me to picture the scene as if I was there. Absolutely Marvellous! I absolutely delight in Anna Nicholas' writing. I have long been associated with Mallorca but live on the West Coast of the USA. Anna's superb style and wit keeps me close to that magical Island from afar. Great blog, it is a really interesting way of knowing what the British expats in Mallorca think of us -the locals- and of our problems. Having lived on the island for nearly 30 years I love Anna's blog as it is well written and extremely informative. Anna's ability to write about so many subjects and always be interesting and humorous is amazing. Living on Mallorca now for five years I recognize a lot in Anna's stories. She lives overhere like we do: with respect to the local people and their traditions without qualifying them, what a lot of expats do to my disapproval... You now what I mean, Anna. Mallorca and Mallorcan people are great, you and me realize the things we North Europeans can learn from them! Thanks Anna forthis amazing blog. Always waiting for your funny points of view on our dear SÃ³ller. I wish I could give Anna 10 stars but the rating only goes to a top of 5 stars.....As American owner of a property in Pt Soller Mallorca-but now splits time between London, America and Spain....I find Anna's writings keep me up-to date with what is "happening".......Thanks Anna! Having lived and worked extensively both in England and Spain, I have followed Anna and her words for some time now. I have found her missives lively, entertaining as well as informative. Life, where she lives, in Mallorca is interesting but she also combines her writings with down to earth real topical happenings through Spain in general, both political and coloquial. Bien hecho / Well done, I take my hat off to her. Anna always tells it how it is!! Look forward to reading many more of her books, a way to relax like no other. Sure she has many more supporters than she truly realises. Always love reading Anna's blogs. Having visited Mallorca on a number of occasions, I like to keep in touch with what is going on. Anna always captures the essence of the island and her humorous slant on life always makes me chuckle! My travel agent suggested reading at least one of Anna's books before vacationing in Mallorca. I have loved my previous trips to Spain and am now armed with the insight to make the most of next year's visit. Always entertaining and also so informative. I feel as if I am part of that community when I am reading her blog. Now that take some skill....! Always a fantastic read. A real mix of key informative as well as offering light relief to the lighter side of life. Outside of the blog she is a remarkable communicator adapting amazingly to individual persons and circumstances. Old school.....in a good way.....yet innovative. Loving this Blog. A slice of Mallorca! For me it is not only a great privelege but also an honour to participate .. reading the blogs and articles written by ANNA NICHOLAS. I began to admire her years ago ... but I feel we dont even admire her enough. So Anna .... thank you for everything. I have lived in Mallorca for the past 27 years and yet Anna's blog never fails to amaze me. Anna has directed me to corners of the island I would have never visited without her knowledge. Keep on blogging! Through her colorful and descriptive writing Anna informs and paints an insightful picture of Mallorca. I look forward to reading her latest blog and as a resident I love to share her books with friends, whetting the appetite for a visit to our island home. Love reading Anna's stories of life in Mallorca, and of the lovely unique town of Soller which I knew in the 60's. She writes so beautifully with the wonderful descriptions of her life with her husband and dear Ollie. Am now looking forward to the next one! Well done Anna, keep going. A great blog with a lot of interesting info and updates regarding the island, written in a personal and insightful way! Thank you Anna for a job well done!!!! One of the best writers of interesting books I have read and has the knowledge. Full of real insight, news, humour and her love of the place. Always a pleasure to read. IÂ´ve been a fan of AnnaÂ´s since reading her first novel and every one since. She shares her life experiences in a way that can only bring a smile (and the occasional tear). A great lady and great reads - always. Anna is a top class writer and always hits the nail on the head. I always find anything Anna writes most entertaining. She is always factual and to the point. Well done Anna, keep up the good work. Anna is the best type of ex pat,blogger and writer. She adores the UK and Spain and writes about them both with love and affection, whilst not fearing at the same time to take an honest approach.Her blogs are always informative and interesting,often delightfully humorous and that gives them a cutting edge that somehow always stays in the memory.If its an Anna Nichola piece I,together with all her devotees, will always find time to read it.Keep them coming Anna and continue making our days both informative and full of life and fun. Anna's blog is superb. Insightful and painstakingly researched Anna focuses on issues that are really important to the expats in Mallorca and beyond. I thoroughly recommend it. Anna's blog on het experiences in SÃ³ller (and the rest of the world) is just great. Reading it, I can literally smell the typical mix of rosemary, the Mediterranean, and nasty smoke that so characterizes SÃ³ller. Absolutely superb, it is a real source of information for all of us who live in Spain. First class. Required reading for all British expats. It's 25 years since I lived in Mallorca, but I still like to keep abreast of what's happening on the island, and there's no better source of info than Anna's blog. It's up-to-the-minute, widely informative, witty and, best of all, she doesn't mind having a swipe at officialdom when a wake-up slap is called for. Estupendo! Anna's columns and blogs are full of her enthusiasm and insights into expat life in Mallorca and wider parts. She is candid, not afaid to assert opinions while leaving space for contemplation. Her observations of island life and culture blend warmly with her British approach to "getting on with the job", Cannot speak too highly of her work and charismatic personality. Hi Anna, I just loved reading your book DONKEY ON MY DOORSTEP and never more so than this year, my lovely son lives in Mallorca and as he now has a 'MINI ZOO' which features two donkeys on his doorstep together with numerous four legged friends, all you write about seems to have relevance to his way of life, and because I can only visit a few times a year, your blogs make me feel that little bit closer to him all year round. Thank you so much for all the humour, you brighten my day always. Anna's blog always reads beautifully. It allows me escape the rate race in my 10 minute coffee break and explore the beauties of Mallorca. As a Mallorca lover since the 60s and part-time resident for many years, I love to keep up with the news via Anna's informative blog. Her observations are full of the insight obtained by living in her chosen 'pearl' of an island and are peppered with things to make me smile on a dismal UK day! Having lived in Mallorca for a while myself and knowing Anna, I have to say that she is one of the few English expats who has really integrated with the Mallorcan people, who widely love and respect her. Being courageous enough to learn and speak 'Mallorquin' has opened new doors to understanding their culture and the ability to transmit it in her books. I love her writing style. Anna writes exactly how she speaks! Reading her books and blogs, is like sitting with her at the cafe in the Plaza, listening while she enthusiastically tells one lively story after another...So funny, so entertaining...the Best! Anna got up and did what so many of us dream of doing - moving to a sunnier climate and living the life; but also keeping her feet on the ground in London's chic Mayfair and all the media clutter she knows so well! Her books and her blog keep me up to date on both worlds, in a timless, yet up to the minute way, mixed with hysterical nuiances and hard-hitting insights. Never stop Anna - we love your style! Anna has a great inside story on Mallorca, she knows who, what, when and where! All delivered with a wonderful earthy humour - just the ticket! Anna could (and does) write about anywhere on earth, but her adoption of Mallorca as her beloved home shines through on every blog as she informs and delights with her brilliant writing and effervescent wit. Should be required reading for everyone and exemplifies what writing a blog is all about. Anna so deserves to win the Expat in Spain Award. As an island dweller myself it's fascinating to read about life on a very different (and much warmer) piece of rock. I have known Anna for many years and reading her work is just like talking to her - as I read I 'hear' her speaking which is lovely. Anna's blogs are a joy to read and are as sunny and charming as she is. Witty and informative renditions of all the must knows of Mallorca and Spain. Highly recommended for travel tips or just for the simply pleasure of reading an excellently written blog. When I read Anna's blog it's easy to forget that I'm not actually right there with her, having a one-to-one conversation! You get a feel for what life in Mallorca is really like. Her take on all the subjects she covers is informative, fair, funny and filled with her boundless energy and love for the the place she calls home. Don't ever stop Anna! In a world stuffed full of blogs, Anna's musings on Mallorcan life are one of only a handful worth giving up any time for. They are informative, insightful, interesting, funny and often provocative. They're a great read. Why? Because they're insanely well-written - an uncommon trait in our SMS-driven world. Brilliant blog, always gives me a laugh and covers an extremely diverse range of matters connected to Mallorca. Elegantly written, thought-provoking, and intelligent... Highly recommended. I am a big fan of blogs and can honestly say the best i've ever read are by Anna Nicholas. She is witty, honest, highly amusing and you feel you know the characters she is writing about. I love Mallorca and reading her blogs and her hilarious books helps me through the dreary english winters till I can get back to Mallorca. She brings areas of the island that i have not visited alive. I love visiting Soller and when there discover places she has written about coming to life. She has amazing insight into the mallorcan mindset and that is not always easy. Keep writing Anna! Amazing, hilarious and insightfully thought provoking - an absolute tonic! Brilliant, and often very thought-provoking, writing that really brings the atmosphere of Mallorca home... and makes us want to live there even more as every month passes! Anna, being another expat who's located in a spanish speaking country, writes with aplomb and humour of the experiences we all share. However Anna's keen eye and observational skills and prosaic writing brings a smile to my face and a tear of laughter to me eyes on most occasions. Bravo Anna ! Please keep up the entertaining work. I've loved Mallorca for 18 years and yet Anna's blog opens new doors to island life everyday. Her warm and witty outlook and her deep knowledge of the place make her blog a must read for me. She brings the Mediterranean sun to the internet. Anna Nicholasâ€™s blogs are always insightful, witty and offer a fascinating view of life as an expat in Mallorca and Spain. She writes about topical news stories, rural life and cultural events which help us to gain a better understanding of life in this extraordinary country. Well done. Well written, researched and presented Anna's blogs are something not to be missed. I have known Anna for the last ten years and have always been amazed by her enthusiasm for and success in whatever she decides to pursue, in particular,of course,her literary talents that are expressed in so many different facets with flair and humour. In the midst of all this work and associated travel,she is able to find time to immerse herself in Mallorquin life, learning the language and participating in a variety of interests and activities. I am a Parisian who visited Soller and Fornalutx some years ago. I have only recently started reading Anna's blogs on the recommendation of friends, and have found them warm, witty, insightful and fun. Thank you, Anna, for rekindling fond memories. I have recently been introduced to Anna's blog and have found it to be wonderfully written and very informative. I definitely give it a 5 star rating. Just came across this well scripted, witty, incisive Blog which is a real tonic. How come we let such talented folk leave our islands at all? The Expats blog by Anna Nicholas is a regular read in our household, giving an amusing insight to the island we share. Thanks for your effort and keep up the good work. Great fun, I love your anecdotes! Anna blog is funny, fantastic, she love Mallorca and is the best ambassador Mallorca can have, looky we are. Anna is spot on, as always! Anna is a wonderful ambassador for the beautiful island of Mallorca, telling the world what a beautiful and fun place it is to visit or live. Always seeing the funny side of life, her books are a delight to read, and it is a pleasure to know her and here lovely family. Anna is a lovely writer and I have really enjoyed reading her blog and her feelings and sentiments are spot on about Spain and our lovely little island Mallorca! She really has a wonderful way to express the " behind the scenes " of what goes on here in Mallorca. I chanced upon Anna blog a couple of years ago and have been an avid and regular reader ever since. I must confess to being a fan of Leigh-Fermor and Newby. Anna follows in their footsteps, evoking a landscape, people and way of life but also combines it with an often gritty and pertinent analysis of current life. The column provides a healthy antidote to life in the wet,cold and often dreary UK. Anna is a great ambassador for Soller, and of course, for Mallorca in general. I am always impressed by her communication skills, and how she has integrated into the Mallorquin way of life. There are few ex pats who could deliver a speech so eloquently in English, Spanish or impressively in Mallorquin so my vote goes to Anna. Molt be ! Anna always makes me want to pack my bags and fly to Majorca if for nothing else to taste her muffins and sip the cava. She tells you how it is, and how she and life jogs along. Her blogs cheer me up when it is cold and wet and miserable here, not only in our summer, but in the depths of winter too. How lovely to be too hot! I love her descriptions of the fiestas, day to day life and the foodie and animal things too. I regard her blog as a chatty letter home and can't wait to read the next one. informative, witty and humorous, as always! Anna needs Mallorca and Mallorca needs Anna! Reading is strongly recommended for all Mallorca lovers. Lots of good and funny news you cannot find anywhere else about the real and hidden Mallorca. Anna, don't ever leave the island! AnnaÂ´s books have brought me enormous delight. Her stories about her family, her house, the people who surround her, her animals and, in particular the story of the little Majorcan frog who has chosen to live at her place, now form part of favourite stories I tell when I go back to Australia to see my family and friends. Her integration in Majorcan life is inspirational to me. She is very informative about Majorcan history and culture, educating me quite considerably, even though I have lived here for 30+ years. Good to have the opportunity to say "thank you" in public. Anna shares the love for Mallorca as I do, a very deep one at that, and this certainly shows in the fantastic, descriptive and imformative blogs she writes. Not to mention her books aswell ! Iam a big fan of her and her blogs/writing. In which sometimes makes me feel homesick for our beloved Mallorca, they are that good !! I love everything this lady writes! Her books make THIS reader feel as if she is living the dream in Majorca. She portrays the characters so well you feel you almost know them. I like the fact she writes not only about her new life but also manages to incorporate historical and cultural facts about island life, as well as humour. Discovered the books via my Kindle and could hardly put it down until I'd read all of them! I admire her too for her humanitarian activities. Love keeping in touch via Anna's blog too. Highly recommended. This lady triggers all my emotions when I read her books. I appreciate very much her broad culture , her knowlege of Majocan idiosincracy, history and traditions, her sense of humor and generosity. ANNA: You are great and you make many Spaniards, like me and my family,feel very proud because of you having chosen our country as your residence. I hope you continue among us, in the Island of Mallorca, for many years. What we need now is a street in SÃ³ller and another one in Palma named after you. What are the authorities waiting for? Good blogging and writing is about passion and Anna's has that in buckets. I love her quirky take on Hispanic life and the fact that she delves beneath the skin of this beautiful country and its lovely people - not to mention the food, wine and culture. Anna is a truly inspirational commentator and a great Ambassador for Iberia. Please keep up the good work Anna! Anna writes a lot of common sense, hers is the first page I turn to in the Majorca Daily Bulletin on Friday. Anna's blog is one I enjoy immensely and I've never even set foot in the country. However, she writes with such warmth and charm that I feel I know the people and area as well as my own. It really is muy bien. Sometimes, when I am sitting at home in a cold frozen England (eg right now! ),I find it difficult to read Anna's blog as it is SO evocative of the beautiful, warm island of Mallorca and I just get envious! But I love her comments and stories, always so full of wit and local knowledge, and it always brings memories flooding back of fabulous happy times on the island. Keep it up Anna - those of us not lucky enough to live on Mallorca need you to remind us what we are missing! Anna has taken Majorca to her heart. Her writing is both informative and insightful and a way that those who consider Majorca a home away from home can kept in touch with the small rich island moments that she portrays with such vibrancy. A great read every time. Anna's way of portraying the cultural differences, with the right mixture of humor, research and respect for the ethnographic idiosyncrasies makes her blog a must have for every 'serious' expat on the island. Anna's blog is a delight to read. Her writing is warm, engaging and very well informed. Anna brings the island alive to the reader and her work is a real delight. She is able to discuss a range of topics that show the realities of life in Mallorca and wider Spain, from its current difficult economic times to the simple pleasures of everyday life. Great! So enjoyable to read Anna's blogs and keep in touch with the island and what is going on. I happened across Annaâ€™s writing whilst searching for books on Mallorca as I had just booked a holiday there. Having thoroughly enjoyed A Lizard in My Luggage, I proceeded to read the rest of the series in a matter of a couple of weeks. Sometimes even a second tome on a similar subject can seem one too many, but that definitely wasn't the case with Annaâ€™s writing. Her books are informative and warm, full of interesting characters and facts about her local area and further afield. Having exhausted the books, I am now looking forward to continuing my holiday research with Annaâ€™s blog. From what Iâ€™ve already read, I will be the best-informed tourist on the island next August! Having lived in SÃ³ller in Mallorca for 11 years it was a delight to read Anna's books. She really catches the feelings, nerves, magic and humour that most English people must feel moving to this beautiful town. Lots of addicting reading with good humour, familiar faces for the locals, and a depth of emotions that people in Anna's situation can really relate to. I'd recommend these books to anyone planning on moving abroad or to just escape into her world. Anna's blog and her writing in general is superbly entertaining and I count myself lucky for having stumbled upon this gifted and insightful narrator of life's charms and idiosyncrasies. Anna's love of the beautiful island of Mallorca is apparent in her writing. When It is cold and grey in the UK, you can read Anna's blog or one of her very warm and humorous books and be transported immediately to her amazing life in this little island with her family and friends. Keep it up Anna with your usual energy and enthusiasm. Anna always finds an interesting angle on aspects of everyday Mallorcan life. As a frequent visitor to Mallorca, I'm always keen to know the stories behind the stories. Thank you Anna for such insight and entertaining writing. I have always been struck by the enthusiasm that Anna puts in promoting Mallorca. An outstanding English woman reading her speeches in Mallorcan language with his charming English accent.I know no other person representing as well as she does mallorca,I hope he stays with us for many years. Who else would I go to for news and entertaining, very well written stories of Mallorca? She's a dynamo and a wit and writes engaging, snappy posts. I'm a fan. Superbly researched, highly entertaining and oozing with passion for an island that has to much to offer - this blog is simply Anna at her Best! Even the dramas and problems Anna encounters in Mallorca are a reminder of why life on the island is so beguiling. Withouth them life would be almost too perfect. For some reason, the combination of Anna's well observed rants mixed with a cast of characters that belongs to an enchanting but slighlty eccentric novel is uncomfortably seductive - especially for someone in grimy, grumpy, glacial London. What can I say? Anna has my vote,because sheÂ´s got all the right ingredients and has an endless supply of creative energy. Great blog!!!! Keep it up!!! As an expat in Hong Kong reading Anna's blog is a wonderful reminder of my own many adventures through Spain, her clever, thoughtful and humorous style draws the reader into her seemingly romantic and enviable personal world at home, with a twist of reality outlining the many challenges faced - insightful reflections which thankfully Anna has chosen to share and long may that continue! Have thoroughly enjoyed reading Anna's take on Mallorcan life over many years via this blog and her books. The one downside is I'm always left feeling hungry after reading the seemingly endless accounts about the local cuisine!!! Anna writes as she lives - with wit, verve and passion. Her insights paint Mallorca in its true, dazzling colours. I love reading about Anna's adventures in Mallorca and Loondon. She's a wonderful writer that makes you want to check out both places for yourself! I was introduced to Anna's blog by a friend and I enjoy reading the articles tremendously. I am hooked and am now a keen fan. Definitely worth the 5 star rating. Shortly before coming to live in Mallorca a friend gave me one of Anna's books to read. I have read them all now and I also avidly keep up with her blogs. In between time Anna has been most friendly and helpful with advices. We'll written and informative blog ! Anna has given me many hours of entertainment, with all of her fantastic books and blogs ! ! Cannot wait for more instalments of life in Soller. Should have a 10 STAR rating !!!!!!!!!!! Anna provides an entertaining Â´inÂ´ to expat life in Mallorca with a great sense of fun and acceptingness of everything that the beautiful island has to offer. A lovely insight to life on a beautiful and colourful island. Like always it is a joy reading your work. It is very refreshing, and very funny. In this days that you always read the same things everywhere. You put in a way that it is easy to understand, and motivates you to put your own grain of sand. Thanks for telling it the way it is Good luck you deserve it. As a regular visitor to Mallorca I love catching up with Anna's blog between trips - it give me just the little 'fix' of island life that I need to get me through the British winter! Excellent blog love reading it, it always makes me smile keep it up please. Anna Nicholas writes with tireless optimism and intellectual energy. Her work constantly captures attention with a wry sense of humour. Whilst the rest of the world is basking in doom and gloom, Anna manages to reveal the good that surrounds us daily. A pleasure to read Anna's blogs always informative, and amusing. Anna Nicholas is one of my all time favourirte writers. I love her delight in Mallorca, and her wit and compassion and care for all creatures - and all people, is inspirational. Anna has brought Mallorca into the homes of readers all around the world with her wonderful books giving great insight into life on this beautiful island .... her usage of animals in the titles and wonderful artwork have also brought a fun, easy and light hearted living element to the readers..... Long may her books continue to delight and inform those not so fortunate to live here in the Balearics!! Anna es una gran conocedora de la isla y tiene una forma de promocionarla que combina la visiÃ³n de los mallorquines con un toque britÃ¡nico muy enriquecedor. Su trabajo nos ayuda a que los turistas conozcan la "otra" Mallorca, la de verdad, a la que antiguamente conocÃ­an como la perla del MediterrÃ¡neo, asÃ­ que estamos muy agradecidos por su colaboraciÃ³n. Anna keeps me in touch with a place I love. She is entertaining, witty and enlightening. Please keep blogging Anna! AnnaÂ´s passion and enthusiasm about Mallorca and life is infectious. We need more people like her! I look forward to reading every adventure from Anna. As my wife Maria comes from Mallorca Anna's adventures bring a lot of Mallorcan atmosphere into our home and give us the urge to return to the island as often as we can. Anna is a natural writer and a great communicator.She has the fun factor.I would nominate her for the Expat Spain Blog award as you can virtually taste the place in her words. Put away your Rough Guide & Eyewitness Top 10 - if you want to know what's going on in Mallorca - or back in London for that matter - check out Anna's all-seeing all-revealing web site & blogs. Amusing & insightful, an irresistible combination. Colourful and entertaining, this blog brings a little bit of sunshine to us who are stuck in far colder places! With an array of posts covering all aspects of expat life in Mallorca, it is a must read for other expats and tourists planning a visit. The only thing wrong with anything Anna Nicholas writes is that it comes to an end - she always leaves us wanting more! My partner and I always look forward to her next offering with eager anticipation and are never disappointed. Just as important as the gimlet perception and depth of insight that shines from her work is the wonderful sense of humour that makes Anna Nicholas our favourite blogger on life in Mallorca. Anna Nicholas is not only a great writter, she is also a very well known citizen in Mallorca and a person with a great capacity in other brands: family, sports,... If there is anyone capable of spreading teh taste of Mallorca, this is Anna. Anna is a super fan of Mallorca, so much we can consider her a "mallorquina". Her blogs and books are entertaining and show what life in Mallorca is about with its goods and its "less goods". In her books is where you really can see the difference in lifestyles as she shows "Mallorca en su salsa", particularly SÃ³ller. Finally an intelligent way to see things, experience them and write them to all of us...with no BS... Absolutely Refreshing and authentic... Keep it up Anna and Thank you behalf all the Readers..
Anna's blog are always so factual and extremely amusing! We all look forward to her witty anecdotes and her rather eventful experiences! Only a delightfully funny and cultured character like Anna, whom I was fortunate to meet,can write such great books! Love, love, love Anna's blog. Almost as much as her books! Lovely work! Look forward to reading some more. Anna's blog is infused with her trademark wit and effortless style. Finely crafted word-smithery is a rarity in the world of blogging. More please! If it wasn't for Anna's blog, while back in Scotland we'd feel very cut off from our favourite place on earth - the Soller valley! Thank you! A very well written and entertaining blog. Anna always injects so much energy and enthusiasm into any subject she writes about. Her knowledge of the local customs and her insight into the way things are done here in Mallorca is second to none. She has a wicked sense of humour and a straight to the point, no nonsense approach to her subjects. Always entertaining reading. Really entertaining! This blog brings a little bit of sunshine to us who are stuck in cold northern Europe! With an array of posts covering all aspects of expat life in Mallorca, it is a must read for other expats and tourists planning a visit. Absolutely love Anna's blogs. Always interesting, amusing, and informative. She's the best! Anna's writing is vivid, fresh and informative. It always akes me want to visit Majorca again. I write somethings,and when my work is as good as this, I'll be quite happy. Great Blog! Bright and cheerful like Anna! Excellent writing. A shear enjoyment to read Anna's works! Love Anna's blog & her books, having family in Mallorca its so lovely to keep updated with goings on on the island. Brilliant blog, excellently written and so informative. When we are back home in the UK, we are kept entertained and abrest of happenings in and around our second home in Soller. Keep up the good work Anna, the books too are an excellent read! Always an interesting and amusing read. A lovely insight into life in rural Mallorca, but also focusing on the important issues to keep those of us with busy lives up to speed! Well done Anna, keep it up. Anna has a brilliant way with words. Her blog is always extremely entertaining and informative. I am a frequent visitor to Mallorca and Anna's blog keeps me up to date with local happenings. It is definitely required reading! Absolutely love Anna's blogs and ofcourse all her books.Her observations of every day life are so funny and entertaining. We have learned so much about 'the' island too. I thoroughly enjoy reading Anna's blog and - of course - her books. Well informed and witty - rather rare these days. Anna's musings are a joy to read, as are her books, and always transport me back to Soller. What more can one ask for when sitting at a desk in England, watching the snow fall. Keep it up Anna! Oh, and more books please!! Anna is delightful and insightful.. what more can I sAY??? a dull day is suddenly warmer and cheery after reading Anna's writtings. Memories come flowing,just with one word "Kent". Lovely lady lovely thoughts and deeds. I really enjoy reading Anna's blogs. Being a regular visitor to the island , it is a wonderful way of keeping up with all that happens on the island , epecially between visits. witty and insightful as well as informative. Anna's blog, which alternates insightful political observations with humorously observed details of local life in Mallorca, is always a delight to read - especially to those of us with a love of the Hispanic way of life. really enjoyed reading Anna's blog updating life on Mallorca is very welcome at this time of year . This is a first for us so we look forward to future blogs . Knowing Anna for many years, her natural liveliness, wit and charme always make it as enjoyable to have a cup of coffee with her as it is to read one of her books! With her enthusiasm and dedication she has created over the last years an exquisite and treasurable little collection of colourful, witty books that are a delight to read and warm the heart. Que la font de l'inspiraciÃ³ mai s'assequi! Un abrac molt fort! Excelente trabajo el de Ana, en el que describe con un estilo Ãºnico la idiosincrasia mallorquina y sollerica y en el que frecuentemente nos vemos retratados. Gran embajadora y mejor persona. Anna's hilarious and often thought provoking blog on expat life in the Soller Valley.... is a really great read. Utterly captivating. For those in the know, I'd love to cycle round Mallorca but I may not be allowed to do so! Keep up the good work Anna. I love spirited people and believe in female power .... Anna, congratulations - you always get it right for me!You have a great sensitivity and the right humour to observe the very truth of matters. Always refreshing and inspiring ... a true asset to expats & Spain! I have known Anna since she first began in PR and am lost in admiration in what she has achieved over the years and now operating from Mallorca. A dedicated Wife and Mother, she goes on achieving and her skill as a popular writer increases with every book that is published. She bubbles with enthusiasm for everything. It is a joy to know her and a privilege to be called her friend. A truly informative and highly entertaining of life in Mallorca. A must-read! Have read all of Anna's books and love reading her blogs about life in Soller. Love spending time in Soller and reading Anna's blogs bring back such happy memories of my time spent in the beautiful valley. Love discovering the resturants and areas of soller that Anna mentions in her blogs. Looking forward to returning to Soler in 2013. You never know I may bump into Anna in Cafe Paris. Anna's blog is so well written and captivating. Her words transport me to a warm climate, and definately tempt me to come and visit. Her humour always shines through, which is something I always look forward to. Anna Nicholas has a way of writing that brings sunshine to the page/keyboard. Anna brings her world alive and makes me want to be a part of it. Anna brings a flavour of sunny Mallorca to the UK - even though we may be experiencing minus temperatures here! I love her style of writing too - informative, fun and sympathetic to those she writes about. A fantastic blog. Anna always makes me feel very homesick for my beloved island. A great blog! Anna's posts are always insightful and entertaining, and are a wonderful emotional pick-me-up when I'm feeling homesick for Mallorca. Reading Anna's post really makes me know Mallorca and our way of life much better, and with a great and intelligent sense of humour. Thanks Anna for this! I greatly enjoy this blog, Anna's wit and warmth shine through the text. Her writing shows her deep affection for the island. It is rare to find a foreign-born "ex-pat" so eagerly, affectionately, and humorously integrate herself into a society such as Soller's, in Mallorca. Anna writes beautifully about life in Soller because she LIVES it. Her observations are not simply those of an outsider looking in, but of a caring and curious new member of a society whose customs are often hilariously at odds with our own upbringing. I've lived part-time in Mallorca for 35 years, and still have great friends from those first years. It takes a few years for a Mallorquin, especially a "Sollerich" to let one into his/her heart. Anna has been accepted and become beloved by many many hearts in both the ex-pat and the native-born communities. This is an accomplishment that deserves a reward! A fantastic blog. I read it when Im in the UK but also when Im on the island. It is up to date, has great information for holidaymakers and locals and it makes you smile. Keep writing Anna! brilliant as ever. Simply the best blog Anna! Very witting and entertaining, while still being thought provoking!!!! If Anna's blog does not win this award there is something seriously wrong with the system. I can think of no better way of enjoying the ups and downs of life in Mallorca from a distance than through Anna's insightful, funny and invariably colourful blogs. As usual and expected Anna comes up with the goods and captures humour, news and a whole lot more. you just have to keep going back for more. An amazing blog. I like it. Good job, Anna! I have known Anna for many years. She used to do the PR for us in London. Her blog is a fantastic insight into living a life as an ex pat in the hills of Majorca, but also her integration with the local community. The blog is witty and interesting at the same time, and she certainly deserves the award. We love this blog! It captures the warmth and magic of that wonderful island and Anna's love affair with it. It is witty and insightful and a delightful read. Long may it keep us entertained. Anna was one of my featured bloggers when I ran the Telegraph Weekly World Edition and her posts were always full of verve and humour. She has a real insight into expat life and a unique take on Mallorca. Required reading! As publishers who produce magazines for some of the best in the world, I can sincerely convey that Anna, both professionally and personally IS the best. She has my whole hearted support and I endorse her, and her work with pride and sincerity. When I am not on the island it's all too easy for it to be out of sight and mind. Anna's blog keeps me connected, amused and above all wishing I was back.